Disclaimer: I bought this about a month ago and just opened it now. We had some signs of freezer burn near the top, so that portion was removed before digging in. A simple scoop: This isn't really an in depth review since I wanted a late night vanilla milkshake and not a big bowl of vanilla ice cream. So, I had a few bites as a scooped the ice cream into the mixing bowl. To be honest, I can't really tell the difference between this and regular vanilla. Maybe if I had them side by side I could, but right now, I can't ...it could also be the freezer burn talking (this recent humidity has been rough on the freezer). The flavor is your typical respectable Breyers vanilla flavor. 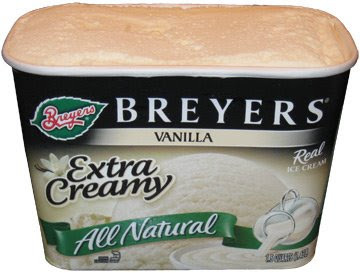 So, it is what it is, typical Breyers quality in a plain vanilla flavor. Oh yeah, the shake didn't come out too well. It looked a smidge too thick, and then I added just a bit too much milk. I was dumping vanilla extract in to try and bring back the vanilla flavor, but it was too late. 1) I wouldnt call it ruined since I didnt say anything particularly bad about it. 2) this is an old review, back from when it was still ice cream. Obviously you appreciate the creaminess of the chemical mix they call frozen dairy dessert, which is fine, to each his own. You are Breyers target market now, I'm their old market, back from the 80s and early 90s.